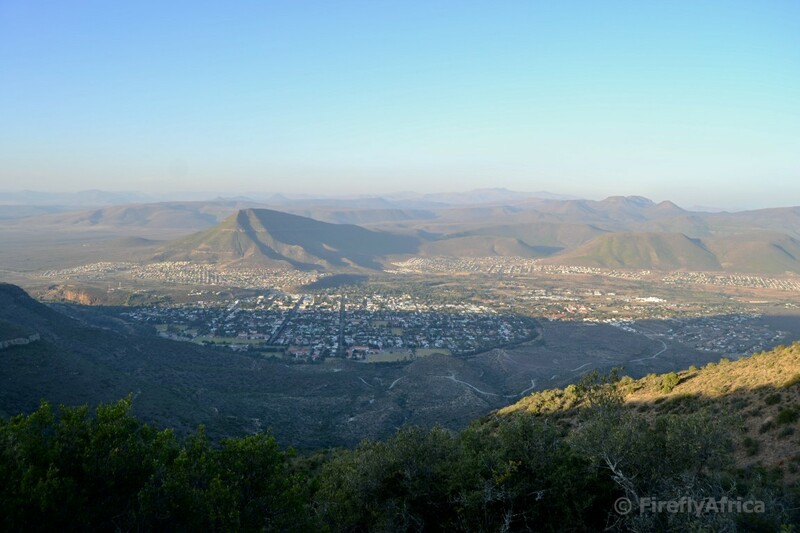 What is the first thing you think of if I had to ask you to name one thing to see or do if you visited the Karoo Heartland town of Graaff-Reinet? I don't know about you, but my answer would be the Valley of Desolation in the Camdeboo National Park. 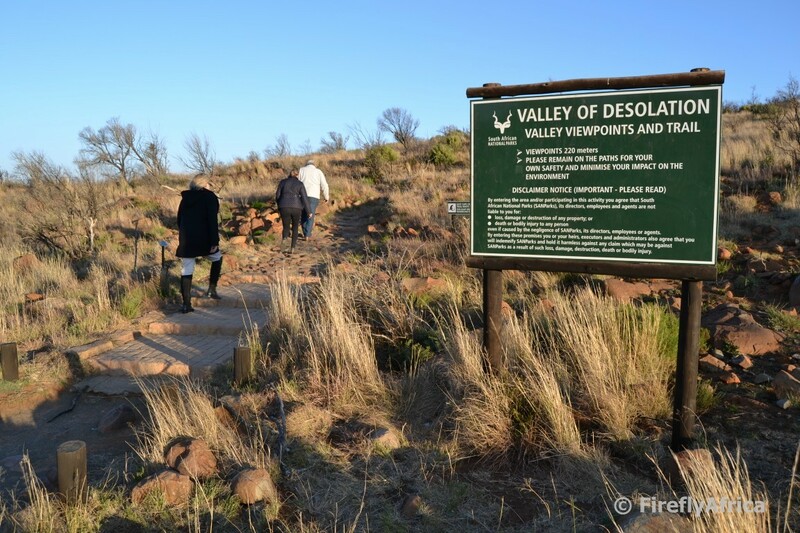 For some reason every time I spend the night in Graaff-Reinet I end up visiting the Valley of Desolation and that reason is that the Valley is one of the Eastern Cape's most iconic must see scenic attractions. 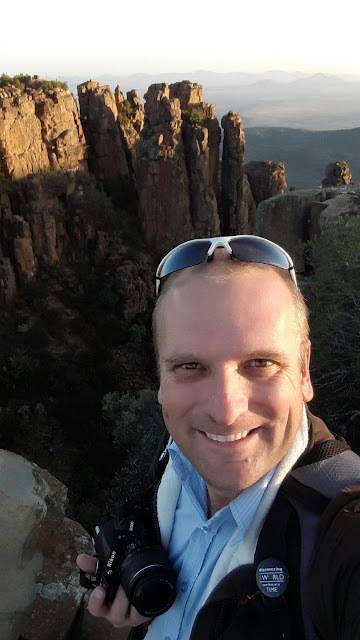 This time around I didn't make my way up to the Valley by myself but was hooked up on a tour led by Oom Buks Marais of Karoo Park Guesthouse in town. 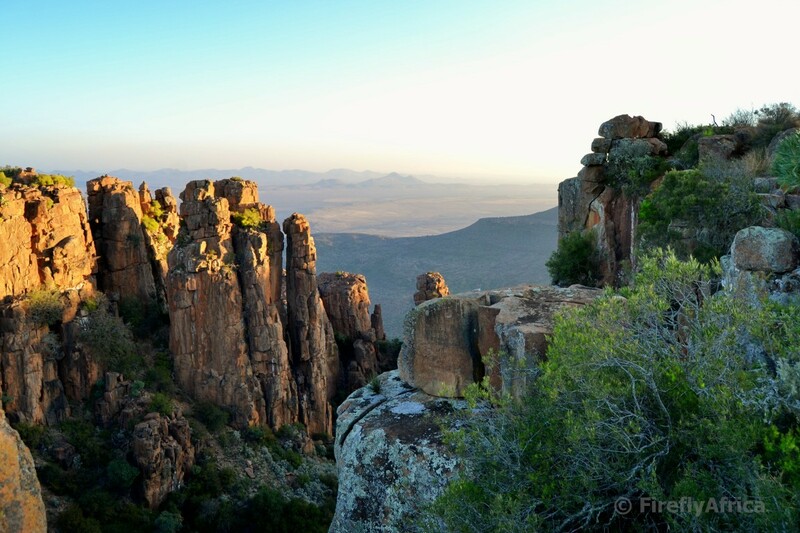 Karoo Park offers tours up to the Valley, historic walks around town as well as night drives in the Camdeboo National Park. Unfortunately this time around I only had time for one of them though. Once in the park the road climbs quite drastically up to the escarpment with great views back over the town and adjacent Nqweba Dam before Spandau Kop and ultimately the Valley of Desolation itself is seen. Once at the parking spot it's about a 200 meter walk to the first of the lookout points with paths and trails taking you further along for to a couple more view sites. One of the things to keep in mind is to always wear comfortable shoes even if you're only going as far as the first viewpoint. The path isn't a boardwalk or properly paved path so trying to do it in heals may just lead to a broken ankle. At the top of the path the Valley of Desolation lies right in front of you. It's more a gorge than a valley, but not sure if the name Gorge of Desolation would have worked. The Valley of Desolation consist of sheer cliffs and precariously balanced columns of Dolerite rising 120 metres up from the valley floor below. These are the product of volcanic and erosive forces of nature over 100 million years and stands against the backdrop of the vast plains of the Camdeboo which makes for a stunning sight. I once heard somebody say that they don't know what the fuss of the view was about. I stood there looking like I was trying to catch flies with my mouth and just stuck my hands out towards the view and made big eyes. Some people just don't appreciate true beauty if it slaps them in the face. Often it's not just a case of come, see and leave, with a lot of people bringing a picnic basket and sun downers to enjoy while watching the sun go down over the Karoo plains. All of this means that it can actually be a very romantic spot as well plus it never really gets crowded so it's not like you are competing for your space in the sun(set). I'm told early mornings are a good time to visit as well although I haven't done that myself yet. On our visit though the wind was pumping and although we were the only people up there, Oom Buks suggested we go down the mountain a bit to a another slightly more sheltered view site once we had out fill of the Valley itself. 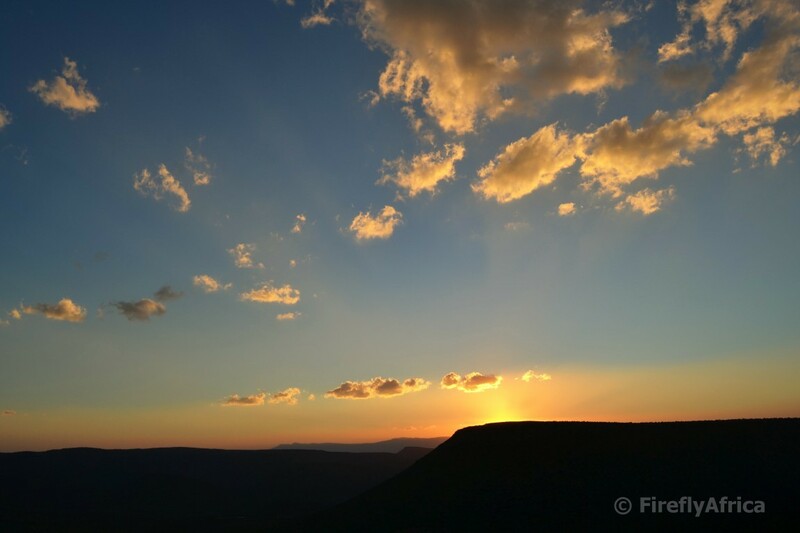 Once there Oom Buks broke out the cooler box and and it was time to enjoy a cold one while watching the sun go down. Plus take photos. Lots and lots of sunset photos to work through later. 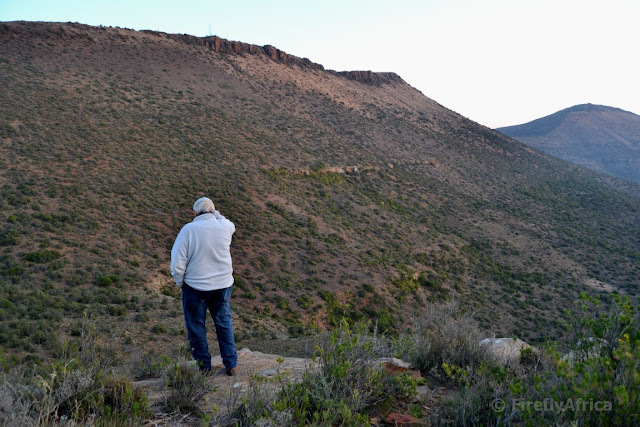 I really like this photo of Oom Buks standing on this rock enjoying the view. A view he has seen thousands of times and just about every day. It shows a man who really has a passion for the Karoo. 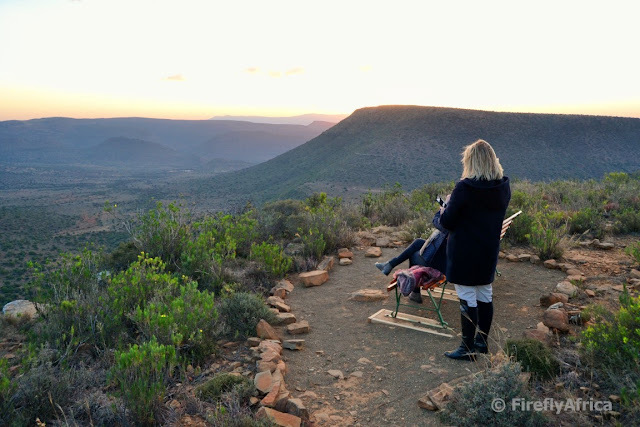 I may be a forest person and really enjoy the bush, but the vast open spaces of the Karoo stays a very special place and one I always enjoy to experience. 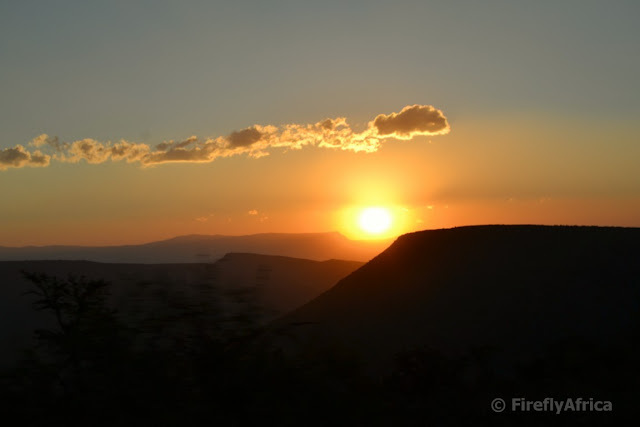 If you've never been to Graaff-Reinet (which means you've never been to the Valley of Desolation either) then I think it's time for a road trip and while there, make sure you take the road up to the Valley late one afternoon to go and enjoy a sunset. And don't forget to bring your camera... and a picnic basket... and a loved one. We all have our travel bucket lists. In actual fact, I have three. One for South Africa, one for Africa and the other for international travel. 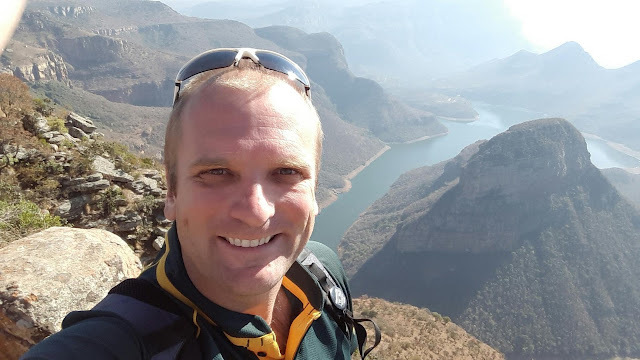 I have never been to Mpumalanga so both Kruger National Park and the Panorama Route were very high on my South African travel bucket list until I got the chance to tick one of them off recently. 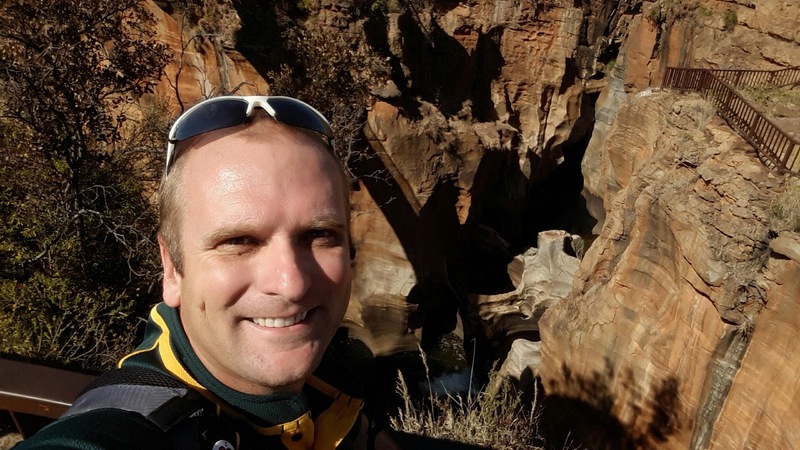 A trip to White River for the SATSA conference meant I had a morning for a pre-conference outing and both a half day Panorama Route tour and a morning game drive in Kruger were on the program. 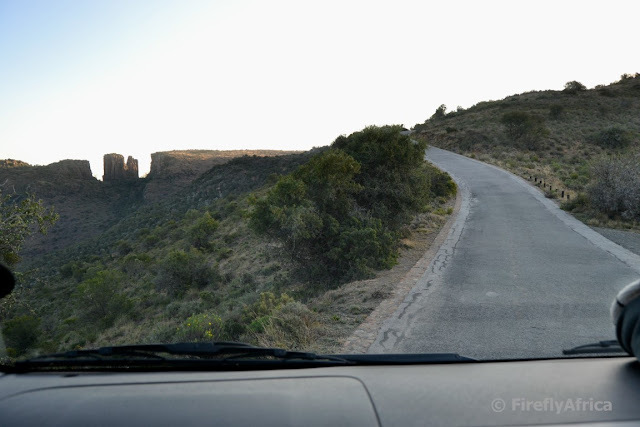 I knew whichever one I chose would just be a taste of the full experience and because I've done many game drives before I opted for the Panorama Roue. 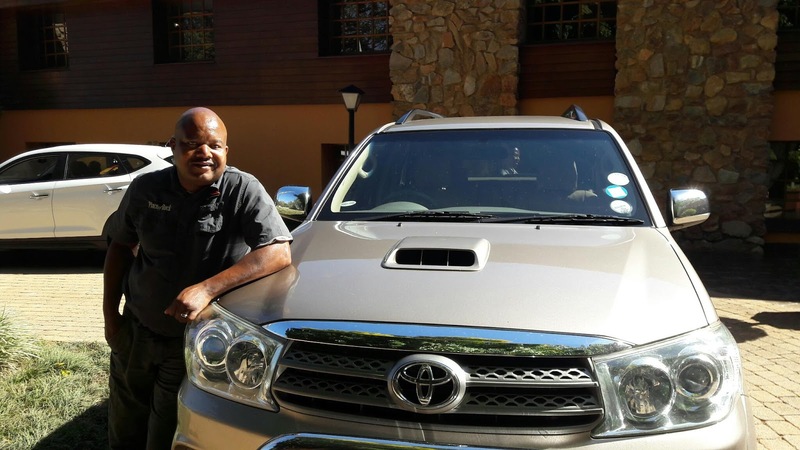 Thursday morning and I barely had my coffee when Vusi Khowane of Place of Rock Tours pulled up at the hotel for our Panorama Route tour. Now usually a Panorama Route tour is a full day tour with stops at all the prominent view sites and waterfalls along the route as well as the town of Pilgrims Rest. As a half day tour we basically had time to see the three main sights and to get a taste of what the route has to offer. 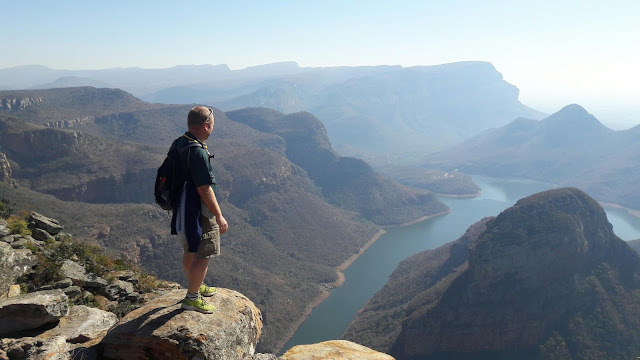 We headed north from White River via Hazyview and Graskop towards the Blyde River Canyon. Along the way we passed commercial wood plantations, macadamia nut farms, bananas and other fruits, beautiful views and lots of villages. Our first stop was at the Blyde River Canyon view site. 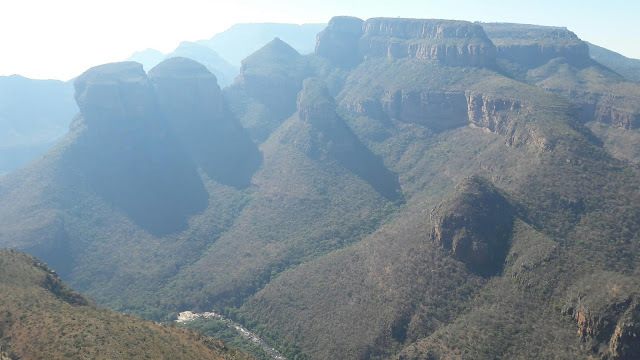 The Blyde River Canyon is said to be the third largest canyon on Earth (after the Grand Canyon in the USA and the Fish River Canyon in Namibia) and the largest "green canyon" due to its lush subtropical foliage. From the view site you get to see one (or rather three) of the Panorama Route's more famous landmarks, the "Three Rondavels". The Three Rondavels are three huge, round buttresses, thought to look like the huts of the indigenous people, known as rondavels. The next stop on out whirlwind tour was the famous Bourkes Luck Potholes. 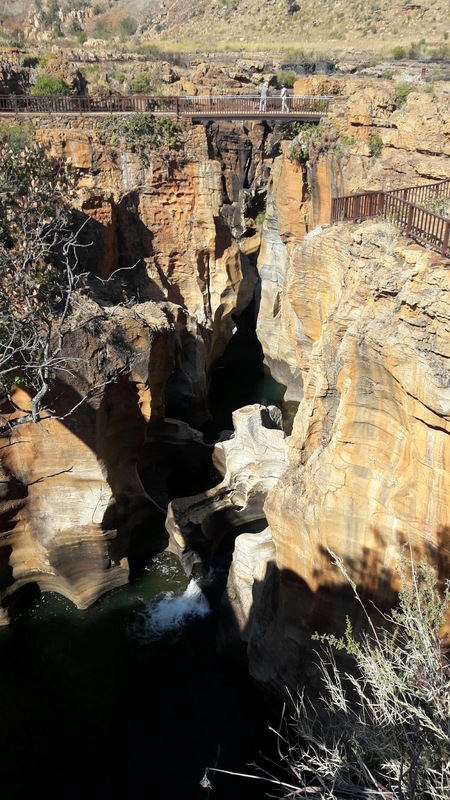 This curious geological feature of natural rock formations and pools are caused by particles of sand and rock that gets washed into hollow areas by the swirling streams and have worn cylindrical potholes into the sandstone bedrock over centuries. The Potholes, named after a prospector, Tom Bourke, who hoped to find gold at this site but never did, can be viewed from walkways and bridges crisscrossing the area. I've seen many photos of the Bourkes Luck Potholes but seeing it first hand was something special. It's really wow and hard to explain to somebody who has never been there so make a plan to get there if you've never been. Our last stop was at God's Window. As time was starting to press and we had to get back, we opted for the Wonderview view site rather than the main God's Window stop purely because of the time constraint. God's Window offers astonishing views over the Lowveld, named so because it is a good 700 meters lower than the high escarpment along which the Panorama Route runs. 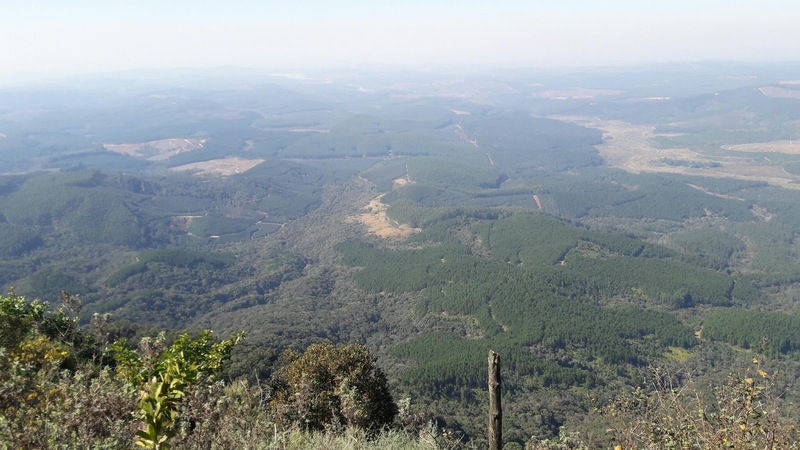 On a clear day you can see over theKruger National Park towards the Lebombo Mountains on South Africa’s border with Mozambique. It was a little hazy on my visit but even so it was clear that this must be one of the most beautiful views in South Africa. 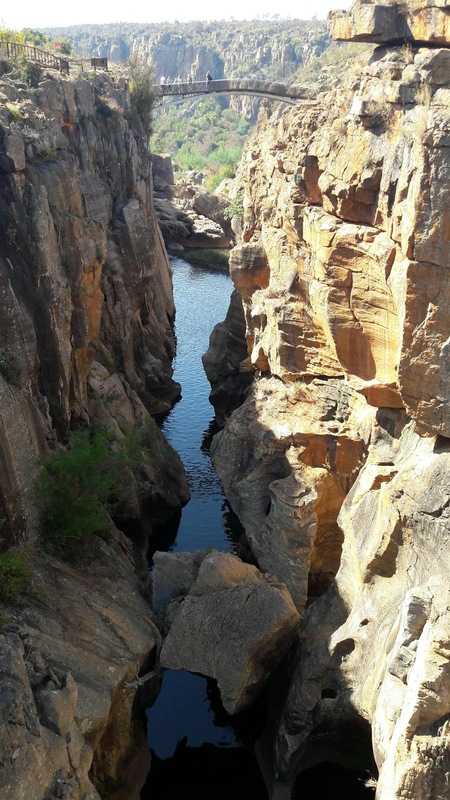 Having seen these three Panorama Route landmarks have really wet my appetite to see the rest of the route as well and that is even more reason for me to bring the Damselfly and KidZ some day on a holiday to show them these wonderful attractions... and obviously visit Kruger. 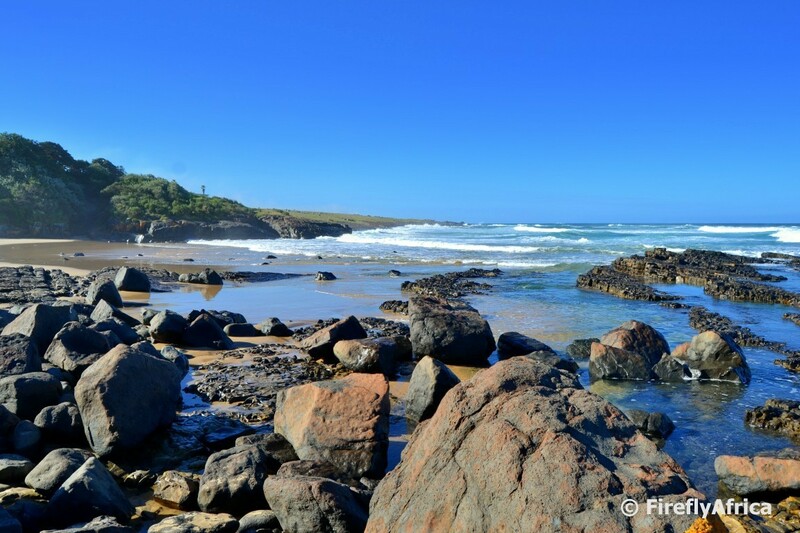 The Wild Coast is famous for it's magnificent coastline which can be explored in various ways ranging from hotel to hotel slack packing, spending time with locals or while staying at one of the excellent family hotels along the coast. I spent a night at Kob Inn at the Qora River mouth and got to have a quick look around the coastline bordering the hotel. I can just imagine spending a few days there in summer exploring these beaches. The coastline on the other side of the hotel. I didn't really get a good photo of the beach in the cove on this side, but it's even better than the one on the other side. 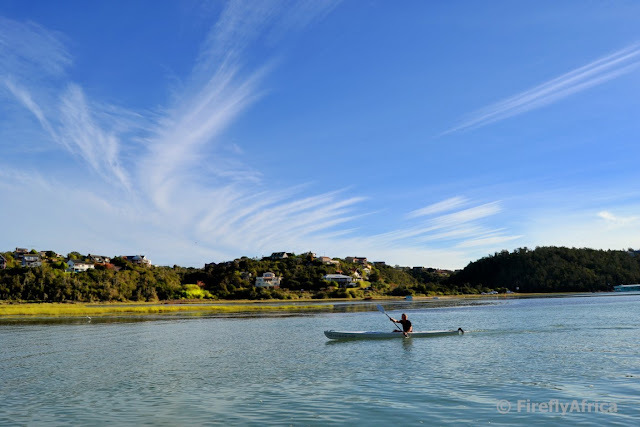 Blue skies, no wind, flat water, warm winters day... Sounds like the perfect day to paddle on the Bushmans River at Kenton-on-Sea. Or at least sit on a jetty and watch somebody do it like we did. I have always just driven the R72 between Alexandria and Kenton-on-Sea and have only just seen the coastline and Alexandria dune field from the air on the occasion that the plane did fly this way en-route to or from PE airport. 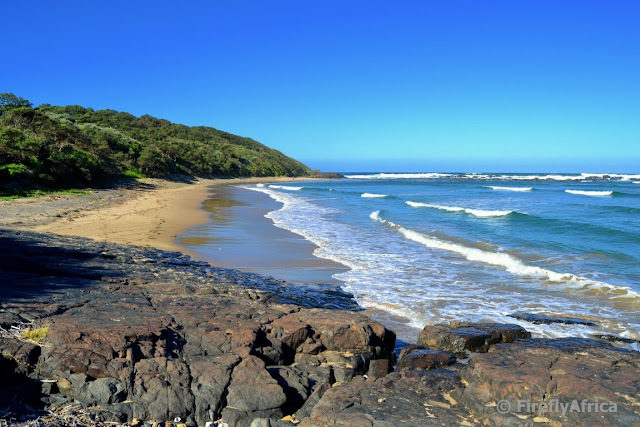 I have also always just heard how beautiful the drive along the loop past Woody Cape is and during a weekend in Kenton-on-Sea decided that it was time to go and see it for myself. We turned off the R72 just outside of Kenton-on-Sea and headed down towards Cannon Rocks before another turn to the right onto the dirt road just before town. My biggest concern was the condition of the dirt road but my mind was quickly at ease and the Polo only had to negotiate two or three slightly rough spots on an otherwise excellent gravel road. The highlight of the drive is definitely the stretch where you see the Alexandria dune field stretched out along the coast in front of you (and thus the reason why I would say the best direction to do this is from east to west). To the left and out to sea you can also see Bird Island with it's very distinctive lighthouse, something not visible from Port Elizabeth. 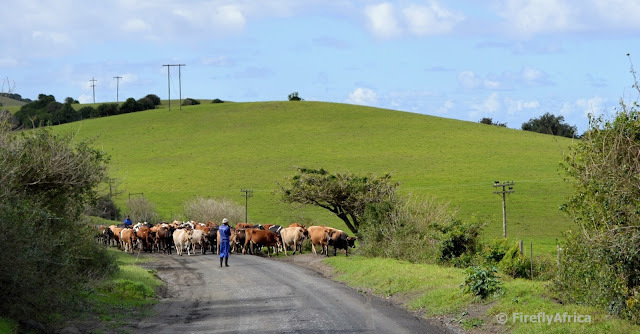 The general scenery along the road is made up of rolling green hills, sea scapes and dairy cattle. It isn't often that you get to see dairy cows grazing with the ocean in the background. I'm sure if somebody had to be blindfolded and dropped here from space, they could easily guess that they are in Ireland somewhere. 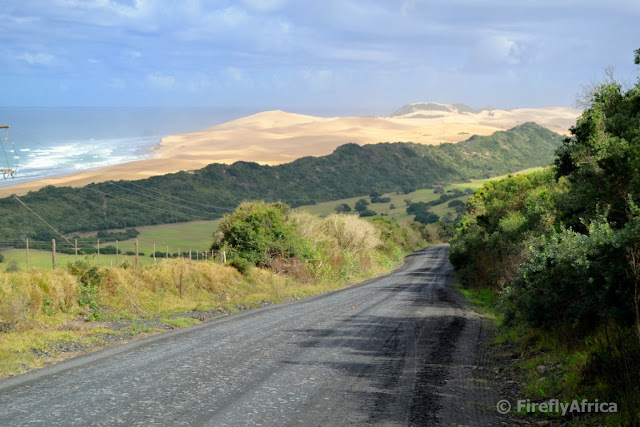 The Alexandria dune field forms part of the Addo Elephant National Park and just after the view of the dunes the road swing inland and you get to drive through a small section of coastal forest located inside the park. A few kilometers later the road delivers you back on the tar road just outside Alexandria and we were on our way back home. 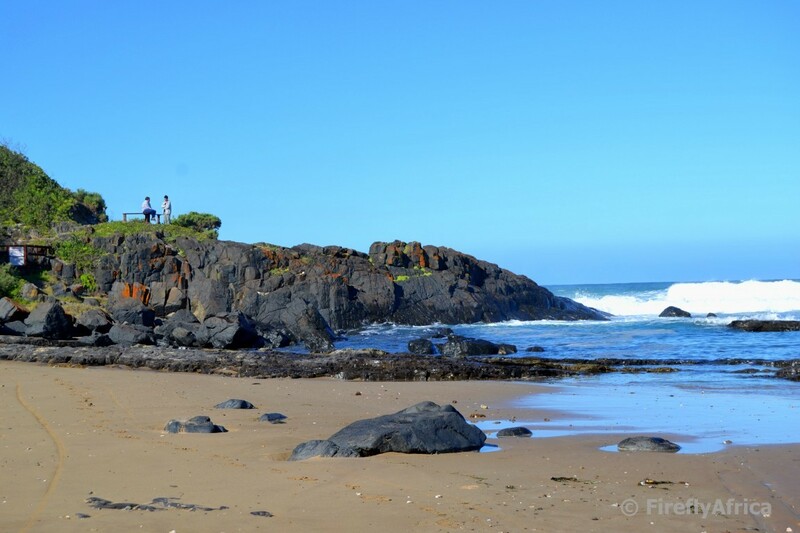 A week or two ago we spent a fabulous weekend in Kenton-on-Sea on Route 72 on the Sunshine Coast. 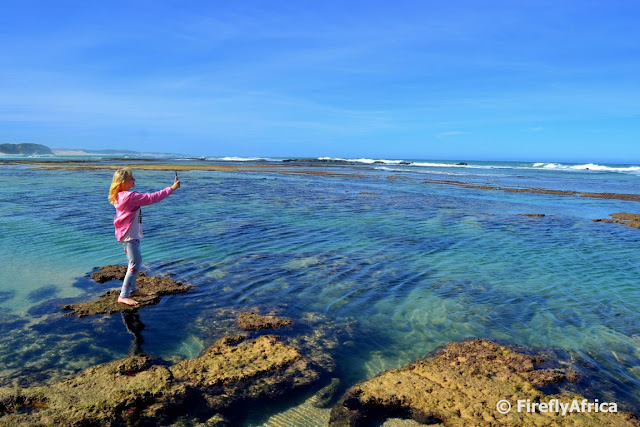 The main reason for being there was to get away for a few days and we made good use of the opportunity to explore the stunning piece of coastline between the mouths of the Bushmans and Kariega rivers. While there both Drama Princess and I did what we enjoyed, snapped away at pictures. The only difference was that she was doing the teenager selfie thing with beautiful backgrounds (at 11 she's in some ways very much a teen already) and I was trying to get her to be the anchor object in my landscapes (seeing that the Damselfly and Chaos Boy isn't always keen to do it). But Saturday night IT happened. She came running with her tablet in hand. The screen was busy fading out and the next minute went blank. And then the taps opened. She was in tears. Let's just say the tablet has gone in for them to check was is wrong and I sure hope it won't be an expensive repair cause it's not like I have a lot of extra money just lying around. Hoping for the best. 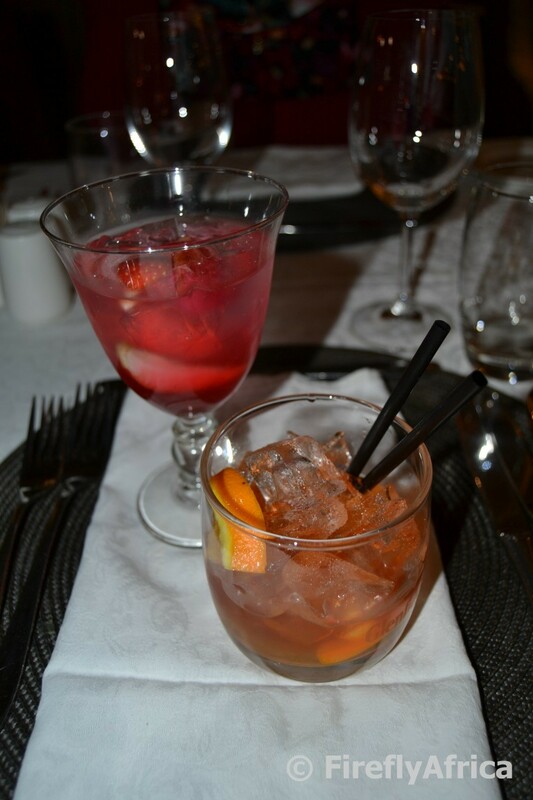 Port Elizabeth is very quickly getting a reputation as a good food destination with visiting bloggers and journalists raving about the variety and quality of restaurants and food markets available around the city in their articles. Now I'm not food expert although I am known to enjoy a good steak / pizza / chop and braaibroodjie / plate of home cooked food / cinnamon and sugar pancake / or > insert whatever food here< on occasion. I'm not the judgmental type (friends not allowed to comment on this) and can be pleased very easily when it comes to food, but I have also watched my share of cooking shows so have learned to not just stick my food in my mouth, chew, swallow and not have an opinion about it. So Facebook will hear about it if it wasn't good. Having known that, the marketing people at Ginger Restaurant probably wouldn't have been so quick to invite me to the relaunch of Ginger at the Beach Hotel. Or if they did, perhaps they had the conviction of their chef's abilities to back the invitation up with. The Damselfly and I were the first guests to arrive the evening (seeing that it was a school night and all) so chose one of the best seats in the house. Right by the big windows with a view across the road towards Hobie Beach and Shark Rock Pier. It was dark though, and raining, but we wanted to sit there regardless. We were showed to the table and was served welcome drinks. Now I'm not a whiskey drinker, but the whiskey cocktail I got really wasn't bad at all. Wonder if they would tell me what went into it so I can try making it at home next time somebody comes over. You know, that's how you impress folk. Ordinarily Ginger would have an a la carte menu but for one night only they had a Relaunch 7 course menu for diners to enjoy. 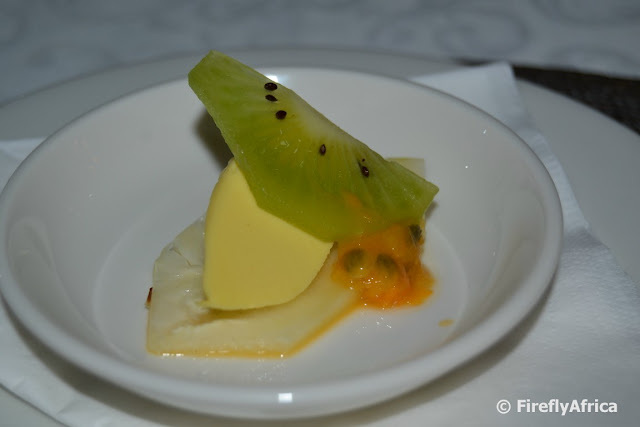 First up was Amuse Bouche. Like I said, I'm not food expert or restaurant critic, so I had to turn to my friend Google to see what it meant. To quote Wikipedia, An amuse-bouche [aˌmyzˈbuʃ] (plural amuse-bouches) or amuse-gueule [aˌmyzˈɡœl] is a single, bite-sized hors d'œuvre. 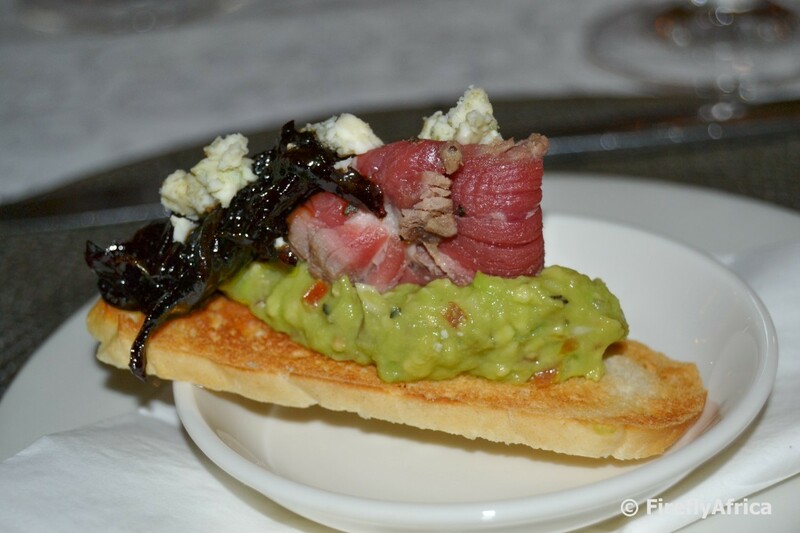 Our Amuse Bouche was made up of rare beef, onion marmalade, blue cheese and guacamole on croutons. Bite sized? Probably more like two bites if you didn't want to struggle to chew because of a overly full mouth. The Damselfly wouldn't ordinarily do the blue cheese thing nor am I an avocado fan, but together this was a bite that ushered in a very enjoyable evening of dining. Ok, so now I also want to know how to make onion marmalade. 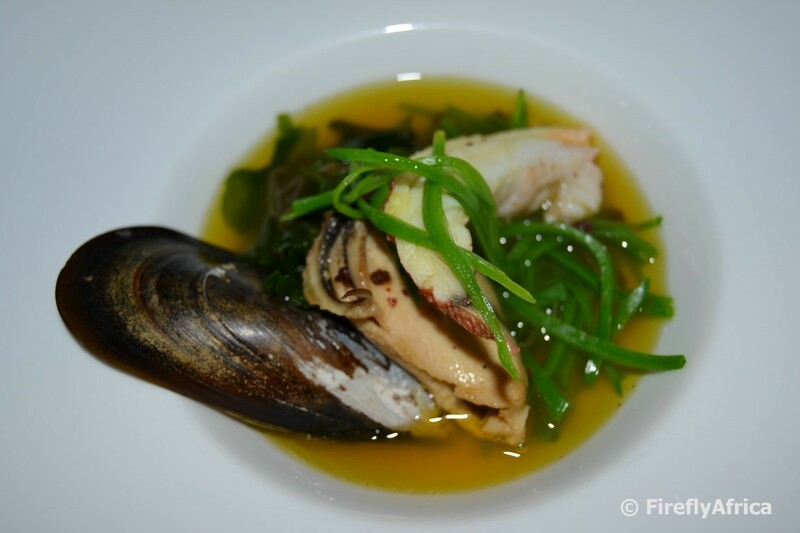 Next on the menu was the Starter consisting of poached crayfish, mussel, mange trout and seaweed salad all in an aromatic chorizo and saffron broth. When our waitress put the plates down I wondered why she had a teapot on the tray but it turned out to be the broth that she then poured over the seafood. The Damselfly who will always order seafood if it's on the menu was over the moon and it probably came in as her third favorite of the dishes for the evening. You'll see her top two below. Unfortunately it was my least favorite, but hey, I only learned to eat Sushi the other day. Please don't misunderstand me, there was nothing wrong with it. I just didn't enjoy it as much as what was to follow. After a sorbet to cleanse the palate (no, I'm not posting a photo of sorbet), the first of two Tasting Plates were served. 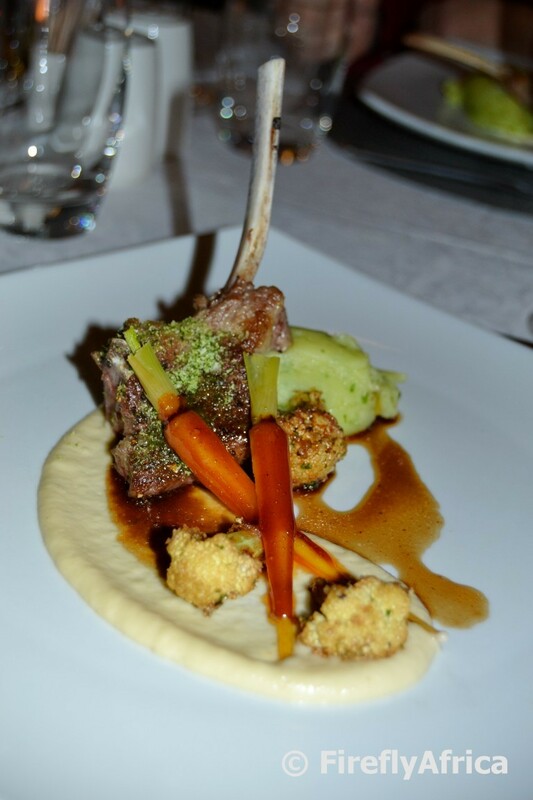 Lamb chop, herb crumb toasted cumin cauliflower pops, candied carrots and a chive mash finished with a natural lamb jus. If they had just served me a big plate of this I would not have wanted anything else for the rest of the meal. The first thing I tried was the cauliflower pops. Nice texture and slightly crispy. Man, I've got to try this at home. The lamb was soft, juicy and the spicing was perfect. If this was made outside over the fire, Justin Bonello of Ultimate Braai Master would have been seriously impressed. Candied carrots? No, not just sweet carrots. Candied like a toffee apple gets candied. Great combination along with the green mash. Perhaps I don't do fine dining enough, but I approached the green mash with a Dr Seuss rhyme in the back of my head before recomposing myself. Can't help but laugh looking back at that. This dish was definitely the favorite one with both of us. 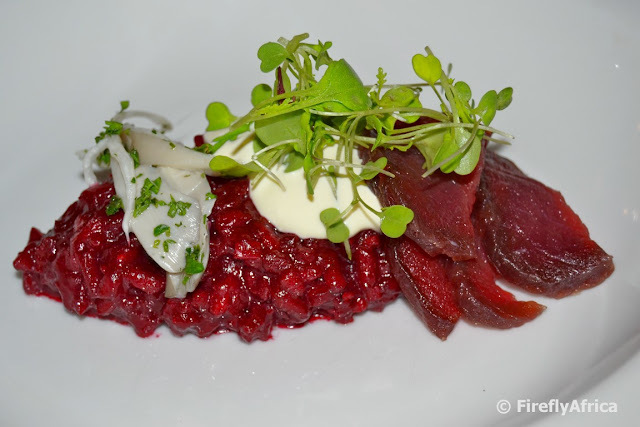 The second Tasting Plate was made up of toasted beetroot risotto, pickled mushroom, home cured venison loan and finished with a smoked creme fraiche. The Damselfly once, many moons ago on a cruise we took, had a very bad risotto experience which often still comes up as a personal joke between us. She wasn't so sure about this one. Me on the other hand dove straight in to find out what the risotto tasted like. A very peculiar taste and not bad at all. She picked a pickled mushroom off and said it tasted sour. This is where watching Master Chef comes in. It's not about the individual components of the dish, but rather what they taste like as a combination. And no, they don't just make that up as something to say on television. I piled a bit of everything onto my fork and took a bite. Mmmmm, now there's a combination that talks to each other very civilised. This time around the shoe was on the other foot and I really enjoyed the dish while the Damselfly didn't. It just shows that it is different strokes for different folks. The Pre-Dessert was more like a different take on a palate cleanser and had a combination of fruit to start the transition from savory to sweet. Bring on Dessert. Dessert came in a close second on both our favorite dish ratings although it could well have been a draw with the earlier lamb. 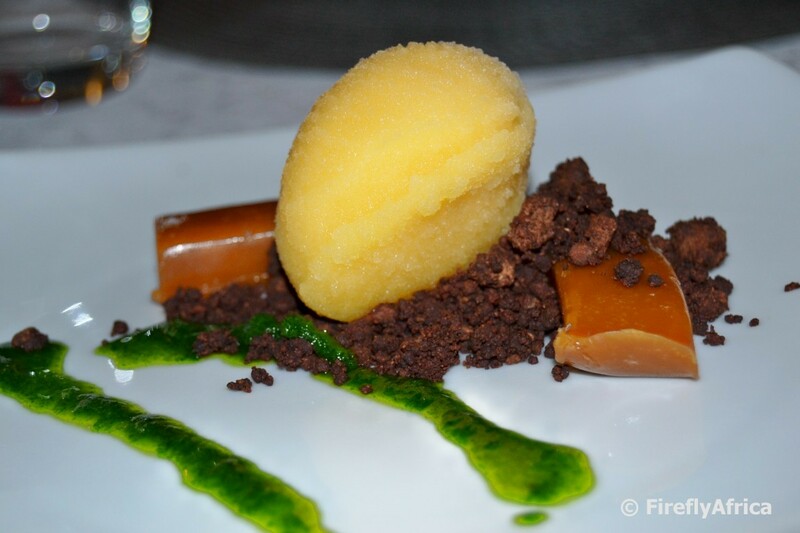 Salted caramel ribbon, chocolate and Frangelica soil, ginger sponge accompanied with a smooth mango sorbet and mint leaves. This was chew your lips off lekker. If Ginger would package and sell the caramel ribbons I would probably have a standing order for them. Yet again the whole combination was a winner. We ended off our evening with coffees and then it was back to real life but with the memory of a great meal enjoyed in the perfect environment. 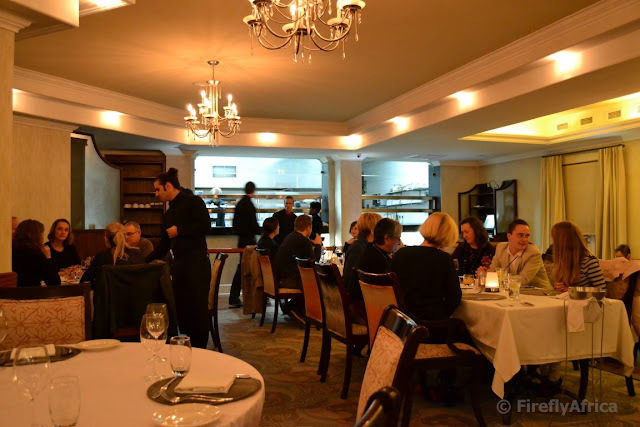 That big boerseun from the Free State would probably have stopped for a burger afterwards, but we found the meal to have been just enough not to feel uncomfortably full, the flavours were perfect and the service excellent. Obviously I will have to come back another time to see what is on Ginger's new menu. Now back to the salted caramel ribbons. Could I perhaps have the recip... Never mind. 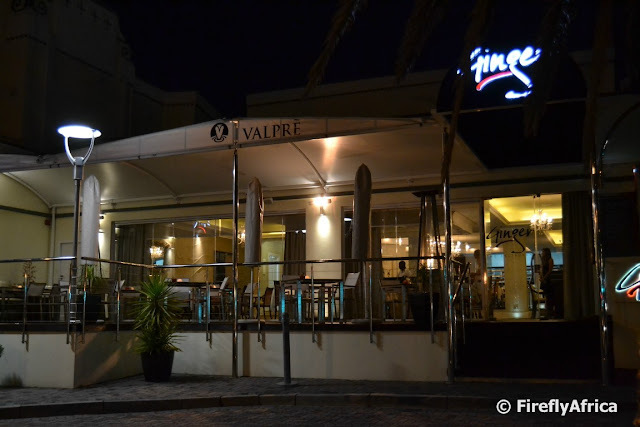 Disclosure: I was invited to the re-launch by Ginger Restaurant as I work in the tourism industry and not as a blogger. They didn't ask for a blog post to be written (and not being a food writer I don't think they even thought I'll post something about the meal) and I keep full editorial control over the post and content. 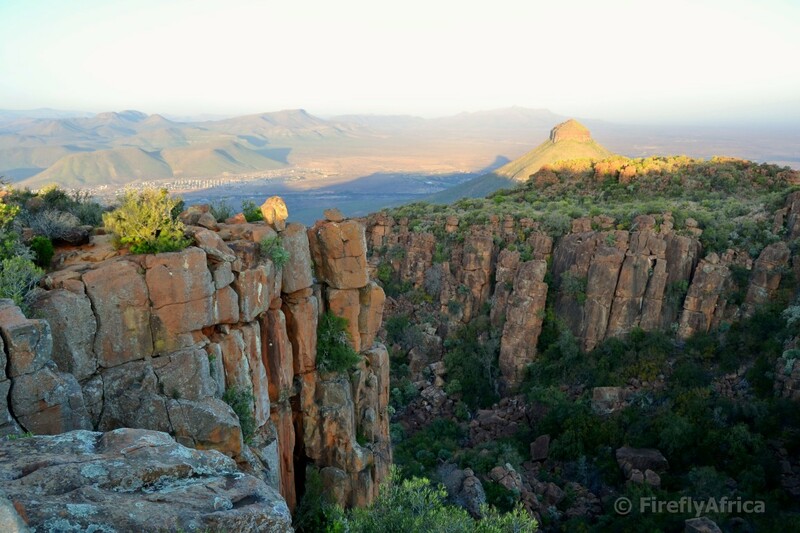 Everybody knows I like to explore and in South Africa we really have so much to discover. So when an invitation to visit Umhlanga and bring the Damselfly along came from the Holiday Inn Express Umhlanga, I jumped at the chance to see a new place and share it with my wife. With two nights in the hotel it meant that we had a whole day to explore the coast around Umhlanga Rocks on foot and really take in what this very popular beach destination has to offer. Waking up Saturday morning we were met with a gale force wind when we opened our hotel room balcony door. "Oh no!" Not the ideal beach weather but nothing short of a hurricane would have stopped us getting out there to see what there was to see. We grabbed a taxi from the hotel and he dropped us off behind the Breakers Resort which is the last hotel on Lagoon Drive on the northern side of town. From there we followed a short path down to the beach and hit the sand. Or more like the sand hit us, but the wind was from behind and our sails were set. 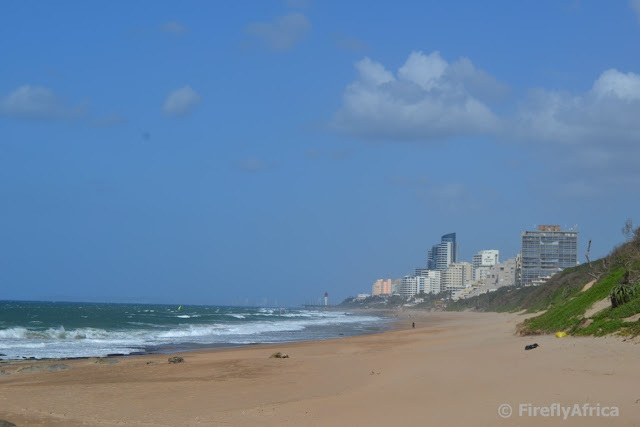 Our first Umhlanga destination waited for us a few hundred meters up the beach. The beautiful Umhlanga Lagoon. 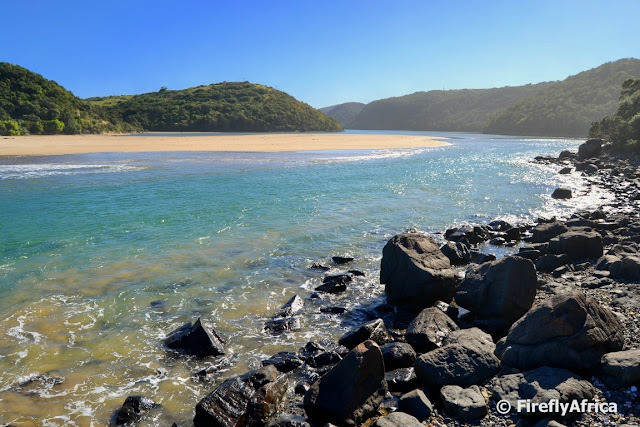 Umhlanga is a Zulu work which means "place of reeds" and the river and lagoon is definitely where the name originated. 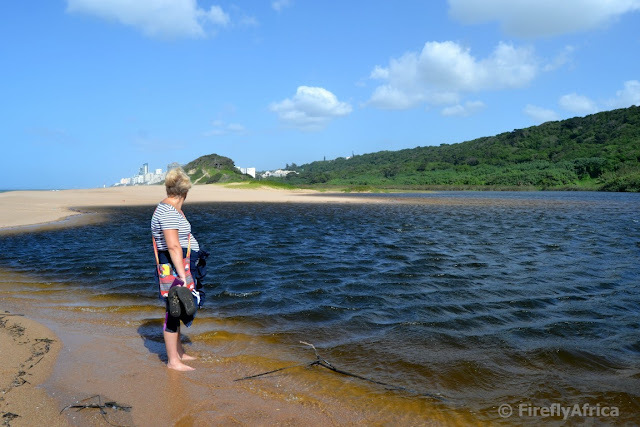 Umhlanga Lagoon isn't just a stunning scenic spot, it's also a well known... erm... come closer... *whispering* unofficial nudist beach. Yes you heard me, don't pretend like you didn't sit up when I said it. Or rather you read it. So just to repeat myself quickly in case you didn't, Umhlanga Lagoon is a nudist beach. Something I found out a few years ago when I got curious about the state of naturism in South Africa and did a little bit of research. I wasn't expecting many nudists to be hanging around (excuse the pun) with the gale force wind as you won't just end up with sand in every possible crevice, but also have the skin sandblasted off your... Ja, you get what I mean. I have to add though that there was a guy who arrived just before us and when he reappeared from behind the dune he was wearing his birthday suit. It didn't last long though as he was heading back fully clothed before we even turned around. I'm sure he's still trying to rinse sand out everywhere. 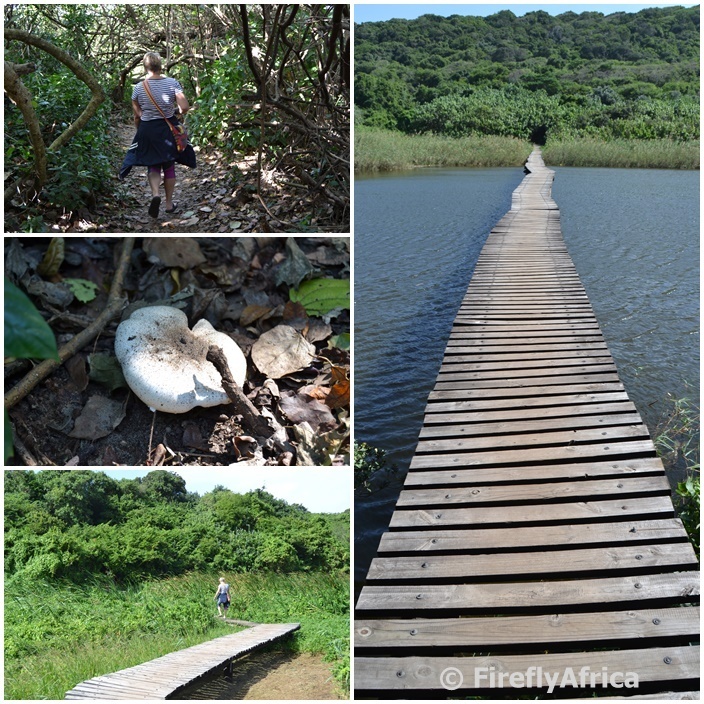 We weren't keen to walk back along the coast right into the wind so veered off the beach and onto the trails leading through the adjacent Umhlanga Lagoon Nature Reserve. 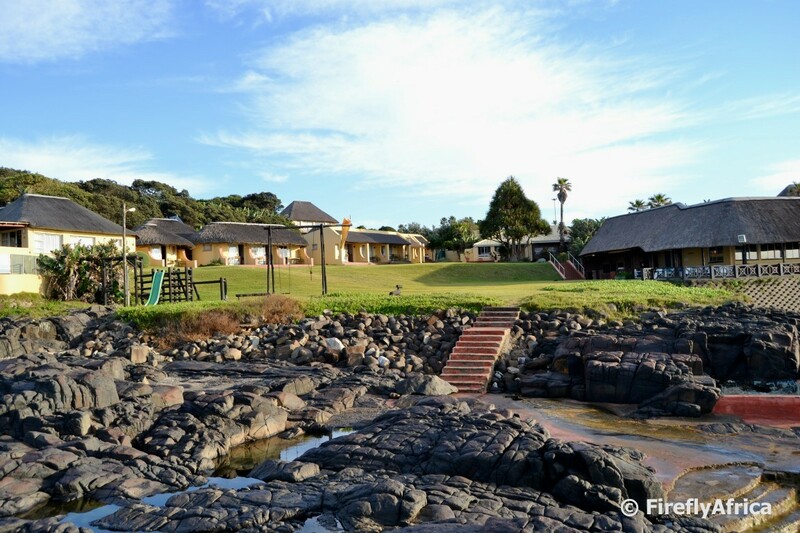 The reserve covers 26 hectares from the end of Lagoon Drive up to and including the lagoon and river mouth. As soon as we hit the trails it was as if the wind had just died on us. Totally sheltered we took a leisurely stroll back towards Umhlanga Rocks along one of the paths, passing a few other people along the way. Clearly this is a very popular spot for a walk for young and old looking to break away to nature close to civilization. At Breakers we left the trail and followed the beachfront walkway between the buildings and the beach. Still fairly sheltered against the wind it was a nice refreshing walk with a lot of restaurant options to get something to eat, vendors to buy something from to take back home as a gift and sea views. Lots and lots of sea views. It's not difficult to see why Umhlanga is such a popular destination. We walked as far down as the iconic Umhlanga Lighthouse, built in 1954. The circular concrete tower, painted white with a red band at the top, stands 21m high and must be one of the most recognised lighthouses on the South African coastline. 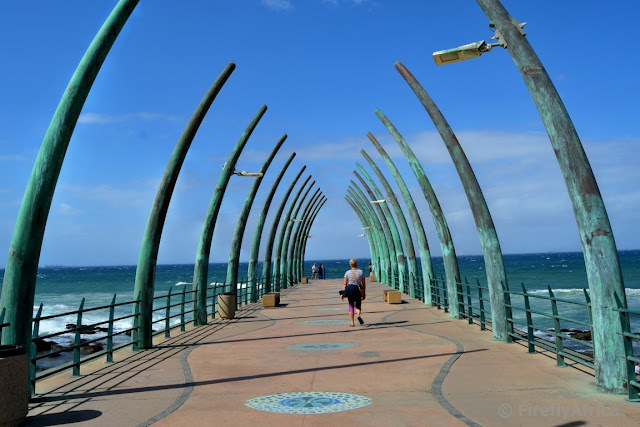 A little backtrack from the lighthouse brought us to the Umhlanga pier with it's curved "ribs". The interesting part about the pier is that there is a large underground box culvert used to take storm water down to the sea with the pier being built on top of the extension taking the water out to a deep water channel 80 meters from the beach. The wind nearly took us even further out but we just had to take a walk down to the end of the pier to enjoy the view. From here we headed away from the beach to go and find something to eat and wait for our taxi back up to the hotel. Staying at the Holiday Inn Express on Umhlanga Ridge meant that we were literally two blocks away from the Gateway Shopping Centre and we took a walk up to the mall on the Saturday evening for dinner. 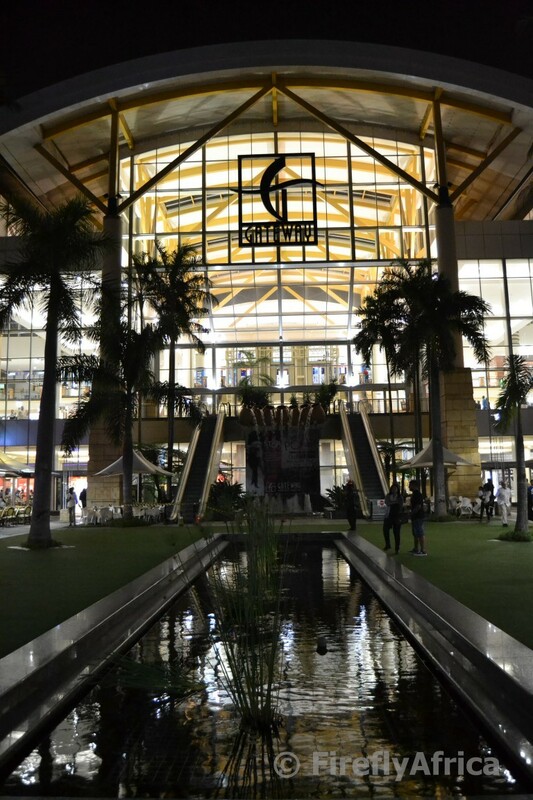 Gateway is more than just a little collection of shops under one roof with a huge amount of retail stores, entertainment and restaurants to pick and choose from. After a little retail therapy and a look around the Wave House we found ourselves a spot to enjoy some good sushi and wine before moseying back to the hotel. 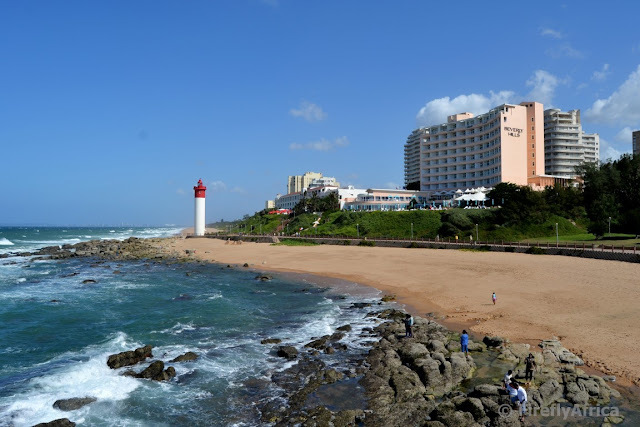 Umhlanga has a wide range of accommodation options with the ones down on the coast being more expensive than those up on the ridge. 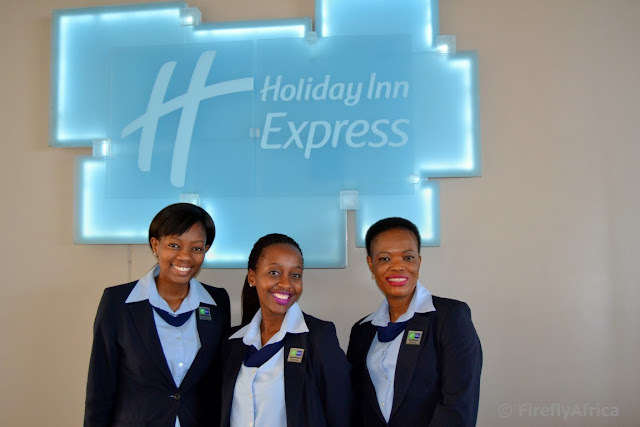 We stayed at the Holiday Inn Express Umhlanga (do go and read my review) and the fact that it wasn't right on the beach didn't effect our holiday at all. In actual fact it's very nicely located to enjoy both the beachfront as well as the Gateway Shopping Centre, has great views, very spacious and comfortable rooms (mush more so than what I was expecting), always friendly staff and all in all a very good choice for an express holiday in Umhlanga. Disclosure: We were invited for a weekend at the Holiday Inn Express Umhlanga by the InterContinental Hotels Group and they carried all the costs for the weekend. They asked for a blog post to be written but had no editorial input in the content of the post.